This is another example of a mortise and tenon joint. However, in this example a piece of dowel rod is drilled through the mortise and the tenon. This helps keep the joint together even when it is under great pressure. This is used as a joint on chairs and other pieces of furniture so that the joints do not break apart when extra weight is applied. If a joint of this type is cut accurately, glue often is not needed to hold the parts together. When the dowel rod is 'tapped' into position the tenon is pulled into the mortise, creating a very tight joint. Below another way in which dowels can be used to form a joint. Modern pieces of furniture are often jointed in this way. It is a permanent method but it is not the strongest joint as the parts can eventually pull apart, especially as the joint becomes old. However, it is a quick to do and saves precious time. Modern glues that are very strong have meant that this joint is often used to quickly fix parts together. 1. Why are dowelled mortise and tenon joints used ? 2. 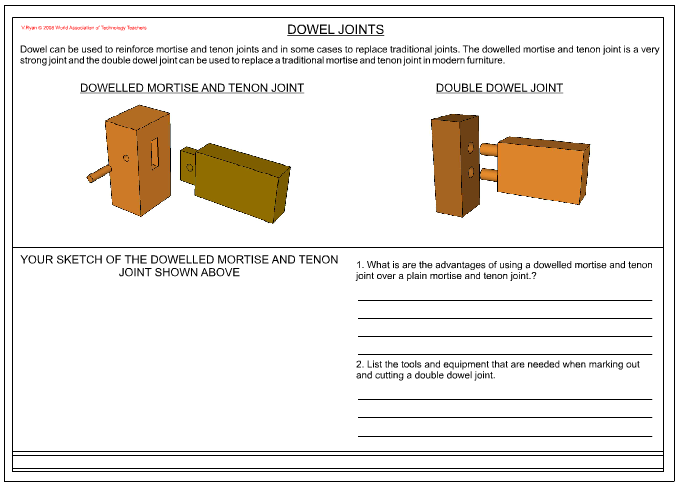 Draw a typical dowelled mortise and tenon joint.